The following is a letter originally published here. I am reproducing the full text because you can hear the author’s heart breaking as you read. You, in your Ivory tower. Yes, you, hidden behind closed doors having my entire future in your hands! Let me ask you this, Mr Presidents: What if? What if your hands, laws, corruption, violence and your rule of kleptocracy were the reason for this revolution? Mr Gaddafi, what if finally your People have decided that it was time for you to go? Is that thought so unbearable that it could, in your eyes, justify killings thousands of your own Citizens? Does it make it more permissible for you to break a mother’s heart every minute of the day, week after week? This with the international community hiding behind endless reasons a no Fly zone would be so hard to implement, playing the offended, fake virgin in front of TV: So why should they stop you in your rampage anyways? You are serving their cause, precious oil – the cause of so much unjustified violence and death. Let me ask you again Mr Gadaffi, do you honestly think We the People are the ones siding with the terrorists of Al-Qaeeda? Really? 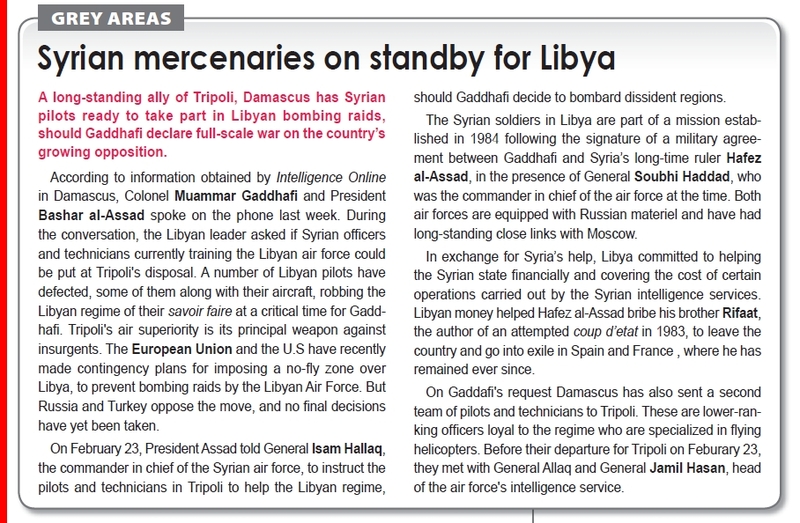 Then, Mr Gadaffi can you explain this arrival of Syrian troops in Tripoli as reported in the current issue of Intelligence Online? Syrian troops who have brought with them more planes and helicopters, as you requested in a phone conversation with Bashar Al Asad in the first week of March? Troops you need to kill your own People? If you are the victim of this crisis as you poorly try to convince us, then why do you need more soldiers to fight unarmed Citizens, whose only weapons are the ones they took back from you, trying to save only themselves and their Families. You Syria! How are you feeling today knowing your president has sent your Brothers to fight Citizens that are as Muslim as you are! How do you sleep at night Syria? Knowing those people have had only one request: To Live as a Free People. The Libyan’s hands are empty for the vast majority. They have no guns, no bombs except for a few seized on the battleground. I’m talking to all of you Syrians: How do you feel knowing you are part of a mass murder financed by Gaddafi Inc.? When are you, Syria, going to stand up for Humanity? You are letting your government use your money to do horrendous things, unconscionable things in the eyes of every Human. Wake up Syria! If You stand idly by and let this continue, innocent Libyan blood will be on Syrian hands. YOU ARE GUILTY MR BASHIR AL ASAD. I can now imagine all other countries smiling, thinking they can avoid scrutiny – Don’t delude yourselves. Let’s talk about you USA, Canada, Australia. Let’s talk about you Turkey, France, Russia. And you Germany, UK, Italy, Bangladesh, India, Japan and China – to name a just a few. Your silence is useful to you at this point isn’t it? It is convenient to avoid talking about those billion dollar contracts signed since 2008 … as these 2 cables show us ( 09TRIPOLI151, 08TRIPOLI912) . The Libyan League for Human Rights spokesman Ali Zeidan said on Wednesday March 3 that the death toll across Libya is about 6,000. We must ask: Are these billion dollar contracts worth more than the 6,000+ Human Lives already lost? At this point, We the People have concluded that NO! They are not. We are screaming ours hearts out as One, protesting as One, signing petitions as One, exchanging images of horror and suffering as One. ALL OF YOU ARE GUILTY! YES GUILTY! And you will pay for this! We the People will make sure of it! You have discredited yourselves, Mr. Presidents, by your lack of action. Your silence has shown the world your true colors, where blood can be shed in all impunity, as long as your precious oil and your petrodollars keep flowing. You have sold us on this Idiocracy for quite a while. You have kept us busy and blind by media manipulation. And now the world can see. And We will neither sit, nor be quiet anymore. As Wael Ghonim said so well. This is ”Revolution 2.0”. …Soon in a neighbourhood near you! Revolutions are notoriously fickle creatures. All too often would-be revolutionaries turn out to be what they hate. The introduction of violence on the scale seen in Libya only serves to prompt revolutionaries to push back. Gaddafi’s practice of importing mercenaries has also inflamed the situation, with innocent African migrants being caught up in the mix. Likewise, the overarching narrative that has been spun in the international media, and often, by the revolutionaries themselves, has taken a particularly nationalist bent and no doubt, this is fall out. But then the character of the Libyan revolution has been wholly different to that of Egypt and Tunisia. The institutions and regimes in these countries have been unique. While Mubarak and Ben Ali had maintained ties with their international counterparts during their presidency and sought to maintain some kind of democratic responsibility through the pretence of elections, Gaddafi, is a different animal entirely. Words to live by: do not become what you hate. Update: BBC reports on Gaddafi’s attempts to recruit mercenaries from neighbouring countries by exploiting the discrimination they face by offering cash salaries to young men, how the attacks on African migrants within Libya and the mistaken belief by many Arab Libyans that Libyans of African heritage are mercenaries. It is a necessary distinction to make. Just because a person is a “black African” in Libya does not mean they are working with or support Gaddafi. African migrants have long suffered discrimination at the hands of Gaddafi’s regime as he used them as leverage over Italy. @Feb17 voices has made the following account of protests in Tripoli available to the world. Listen to it here. I visited a dungeon underneath the sacked army base today. Residents said last week it was the most feared room in town.